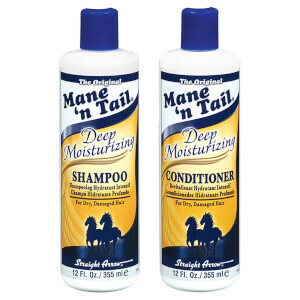 Treat dry, damaged hair to the Mane 'n Tail Deep Moisturising Conditioner; a weightless formula dedicated to repairing, strengthening and hydrating from root to tip. Massage onto freshly shampooed hair. Leave on for 1-2 minutes, then rinse. As like the shampoo this conditioner is fabulous. Leaves hair so soft and easy to manage. Best ever!! I haven’t reviewed any of my other purchases from Look Fantastic because it’s too early to tell yet if I like the product or if it does what it claims. But as for this conditioner I can review it now, because I absolutely love it! It smells great, isn’t too thick or thin and makes my hair feel instantly soft and deranged! I think I tried the original conditioner from this brand and I wasn’t a fan, but this one I love and will repurchase for sure. I have thick, frizzy and dry hair. Since my first use this conditioner has become my favourite. It leaves my hair so soft and smooth!